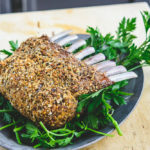 Rack of lamb is not something we eat every day, but Easter’s coming, and this would be a nice (and special) change from the usual ham. It’s not cheap, but it’s such rich and tasty meat, that a little goes a long way. I like to save it for holidays or special occasions. My brother (who has since passed away) loved my Rack of Lamb, so it has a special place in my food heart because it makes me think of him. And now it’s packed with even more flavor, since I’m using this meatball mix as a coating. 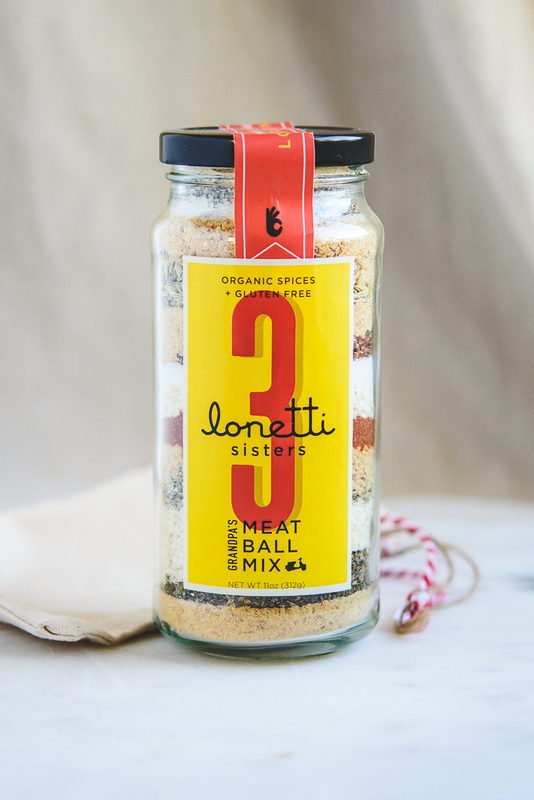 The 3 Lonetti Sisters make a mean meatball mix, thanks to their Italian gramps (who grew up on the east side!). A great local product made with all organic ingredients, and gluten-free breadcrumbs. 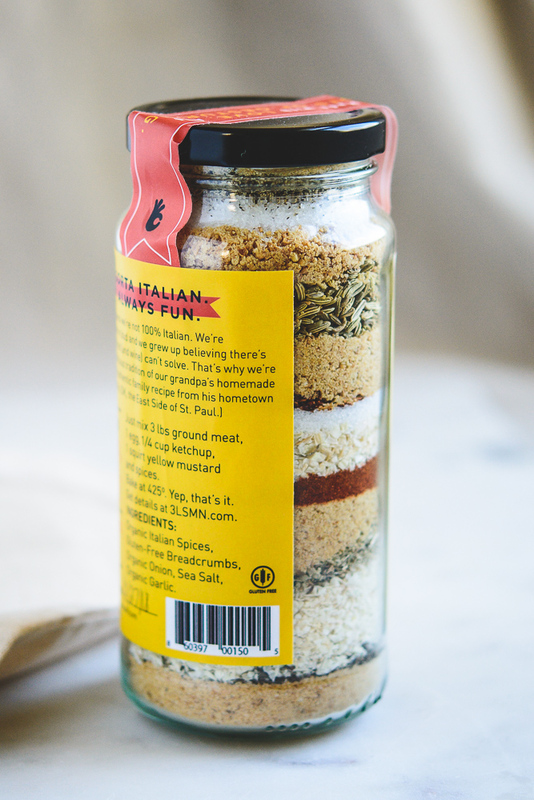 This mix really packs a flavor punch, I tasted fennel, garlic, oregano and other spices that look like they are a secret! I love their taglines: Made with love and lots of hand gestures! and ‘Cousin Vinny Approved’. What a hoot. I LOVE how they embrace their ‘Italian-ness’ (yes, I just made up that word). The sisters approached me to try their mix and write about it on my blog, that is if I liked it, well, I love the stuff! I may even have to make meatballs, and this Irish girl isn’t much into meatballs, but I’m quite certain they’d be delish with this mix. 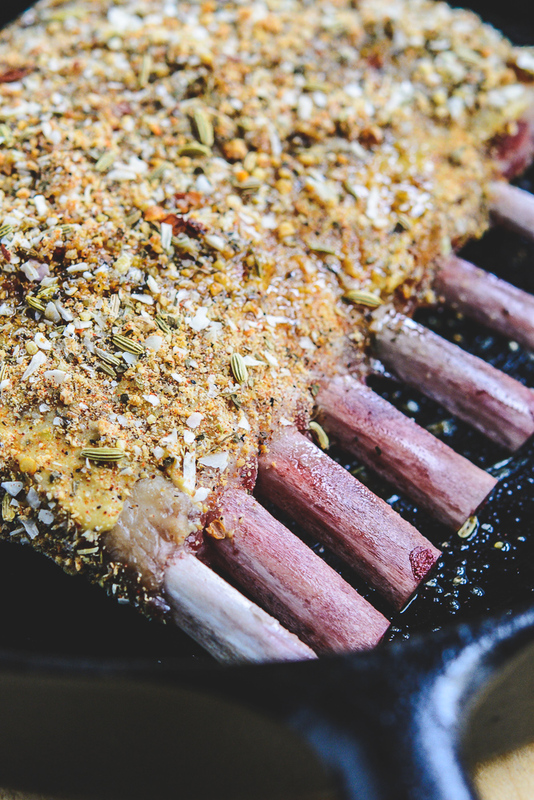 I thought it would be fun to use the mix in a different application, and the rack of lamb sounded perfect. Save any leftover meatball mix in the jar, you’ll have more than enough for about 2 pounds of meatballs! All coated with dijon and meatball mix, do you think it’s having an identity crisis? My next post will be Potatoes Dauphinois, a lucsious, creamy potato number that will go perfectly with the rack of lamb. Perfect for Easter dinner, stay tuned. 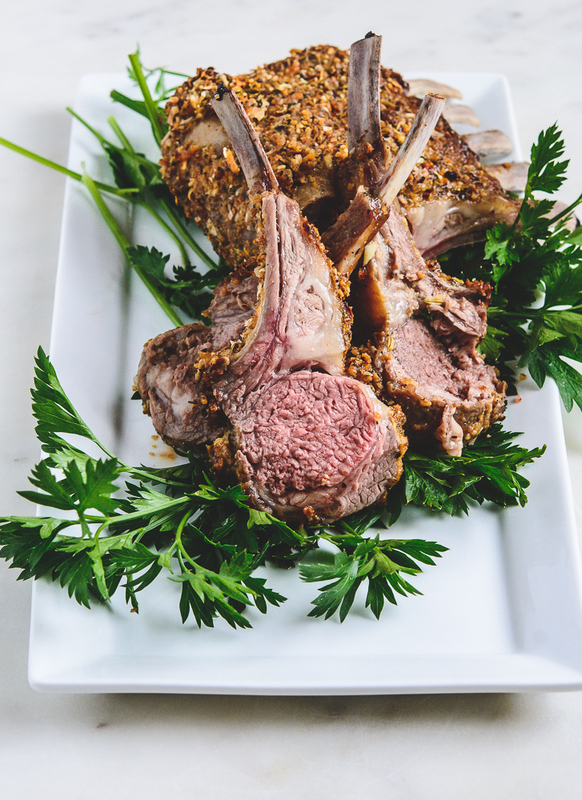 Rack of lamb, typically come with 7-8 bones and will weigh about 1-1-1/2 pounds. Plenty for 2-3 people. The term ‘frenched’ just means those bones have been trimmed of fat and any extraneous meat. It sure makes for a pretty cut of meat! Preheat oven to 400 degrees with rack in center. Over medium-high heat, place a large cast-iron skillet (or other oven-proof skillet) and heat until very hot. Rub lamb with oil, and season with 1/4 teaspoon salt and 1/4 teaspoon fresh cracked black pepper. Place in skillet, and sear until golden brown all over (including ends), about 3 minutes per side. Remove to a plate and let rest for about 20 minutes. On a shallow pie plate, add the meatball mix (or whisk together the option in the ingredient section). 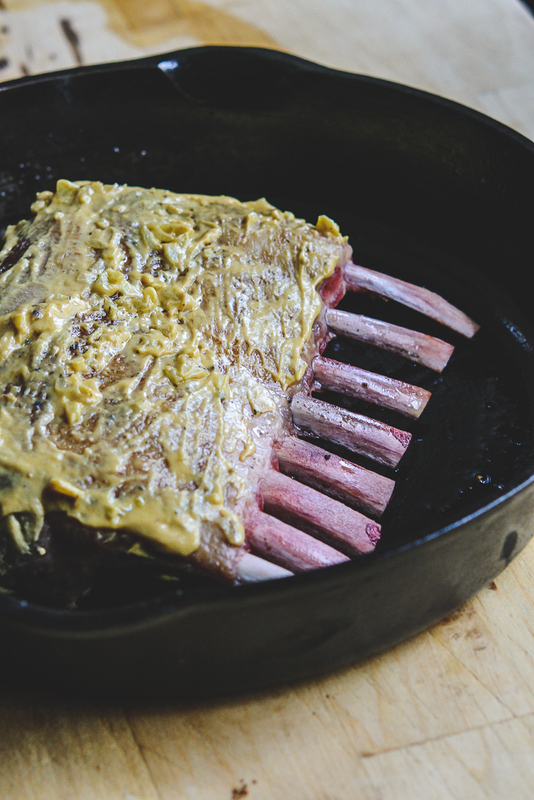 Brush lamb with Dijon, coating all sides smear on the chopped garlic. Press-in the breadcrumbs over the rack, covering all mustard in an even layer. Place back in the same skillet and drizzle with a little more olive oil to help the breadcrumbs brown nicely. Roast until the temperature reaches 130 degrees (for medium-rare) on an instant-read thermometer, about 20 to 25 minutes. Let rest 10 minutes before carving into chops. The Dijon mustard helps to cut the richness and balance the flavor of the meat. When carving to serve, you may need to wiggle the knife around the ‘chine’ bone, don’t try to saw through the bone, but maneuver the knife around it gently. Look at all the fun layers in this mix. Those are some patient meatball mix elves! Garlic Bread, don’t worry, double carb it!